The Absorbascon, The Great Curve, The Comic Treadmill, Near Mint Heroes, Cognitive Dissonance, Blog THIS, Pal!, Gutterninja, Trusty Sidekicks, Dave's Longbox, The "brilliant" half of Repent Sinners!, Return to Comics, and Polite Dissent. All others will not want "Seven Hells!" shouted their way. Shane, ya never know. take it from a comic book store manager. I know I'm buying it mostly to look for ammo! I just want to say that I am doing this for fun, we all are. Sadly, it's lots more fun than the actual R vs. T comic series! 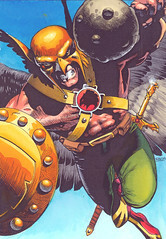 However, that does not change the fact that Hawkman is having personal problems, and Rann is about to unleash its new super-weapon! Thanagar's days are numbered.